A T-square is a technical drawing instrument used by draftsmen primarily as a guide for drawing horizontal lines on a drafting table. It may also guide a triangle to draw vertical or diagonal lines. 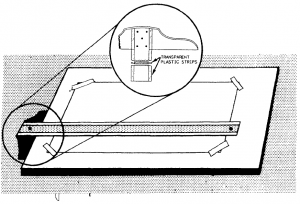 Its name comes from the general shape of the instrument where the horizontal member of the T slides on the side of the drafting table. T-squares come in varying sizes, common lengths being 18“, 24″, 30″, 36″ and 42″. 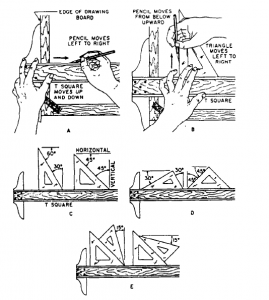 The top of the T-square hangs off of the drafting table and is called the head; the blade is the part that stays on the drafting table. The T-square usually has a transparent edge made of plastic which should be free of nicks and cracks in order to provide smooth, straight lines. T-squares should not be used as cutting instruments. 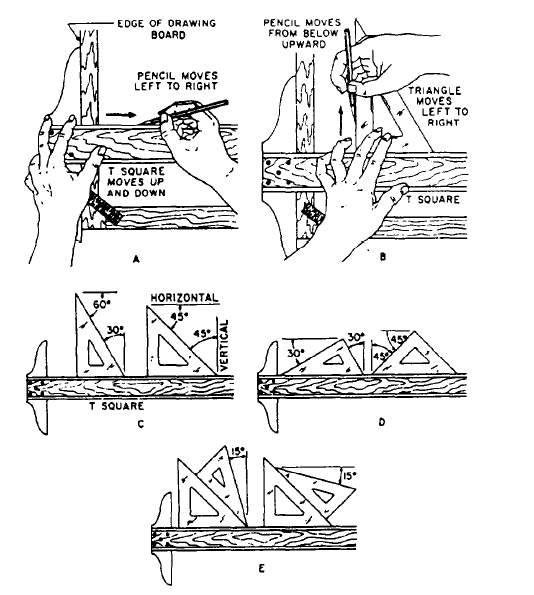 One might cut the T-square in the process, damaging the straight edge and rendering the T-square useless.